The way I see things, toys are for PLAYING WITH not LOOKING AT. Dave has this morbid fear of the boys toys being broken, or scratched, or misplaced, or anything that prevents them maintaining their "as new" condition. 1. The toys are designed to be played with by children, they're pretty hardy, they're NOT collectors items. 2. If the kids aren't allowed to play with the toys until they are "responsible enough" (by which time they mostly lose interest, anyway), what's the point of spending the money in the first place??? How to deal with this? Well, at the moment I'm going with the bulldozer approach because I've repeatedly tried the softly, softly approach to no avail. I'm getting some big clear tubs for the boys to store their lego sets in, so no longer displaying them on top of their shelves. The old boxes are going to be binned! If DAVE wants to COLLECT lego as a collector's item, he is more than welcome to spend his money on doing that for HIMSELF. Bryn will be allowed to play with Tracy Island and all the Thunderbird stuff. I will supervise him (not too closely) and encourage him (as I always do anyway), to be respectful with his toys. If they do get broken though, at least they got used! I don't know WHO Dave is saving the toys for. His parents kept his toys after he outgrew them (as pictured above). The toys are still in the house, sometimes Erik and Luey get to play with them, mostly they just sit in boxes, unused, it's such a shame, and imo a WASTE! LOL, of course toys are to be played with, and shared too! It's so hard to NOT share toys. I do understand his angst as a fellow only child - we didn't have to share and still struggle with the concept...but what a great lesson for our kids. 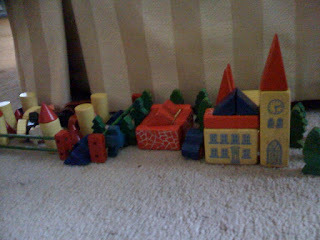 BTW I'm starting a blog for F for his legos...that way we take a photo of his creation and then he breaks it and makes something else. Instructions are also available online for things that go missing. We regularly print instructions and F makes do with the pieces he has even if they aren't from the original set.